Mung Bean Sprouts are mostly used in the Asian cuisine and they are full of vitamins like A, B, C, E and also rich in calcium. Here is a healthy curry I prepared recently with these bean sprouts. It tasted so delicious. In a pan, heat oil and add all the ingredients one by one except milk, cover and let cook for some time. When the mixture seems cooked add milk and salt. Leave it for sometime on medium flame until all the water in tomatoes gets absorbed and the curry becomes thick. When it is done, transfer to a serving bowl and enjoy with chapathis/puris. 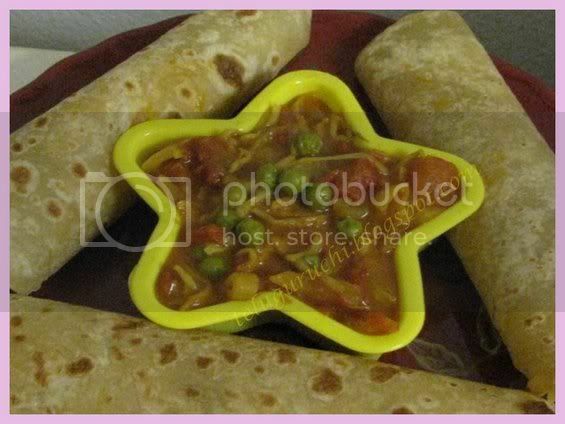 nice presentation..lovley pictures looks yumm..
Thats one protien rich curry for chapathis. Liked your presentation. Uma, I'm back.. This looks yummy dear..! Never ttried this before,sounds great Uma! Curry looks very delicious Uma. Love the presentation & bowl. Check out MBP: Kids Menu & if possible do participate in it. healthy curry ! Beautiful presentation and bowl . 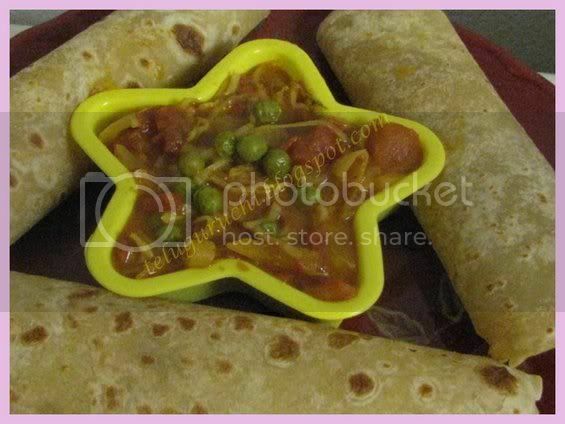 love sprouted beans..curry looksyummy in that bowl along with chapatis..
Love the way you have rolled up the rotie and love the moongbean dish. Great click Uma..Love sprouts..Curry looks delicious..
uma, visit my blog for veg cutlet. 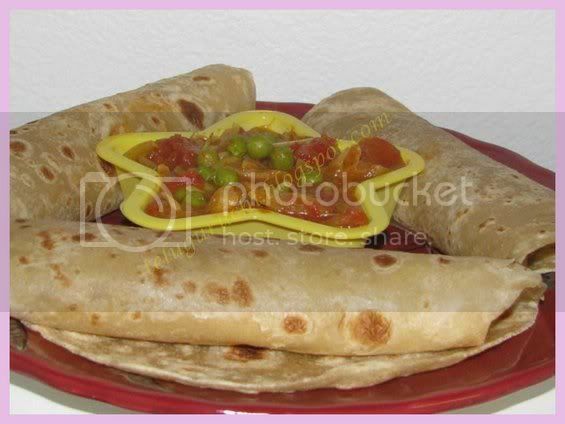 oh those rotis look super...what aata do you buy? we don't get indian aatas here like pilsbury or aashirvad.. gravy looks yum too. The gravy looks awesome,love bean sprout ! A Very Healthy meal. I have never cooked sprouts. always eat them raw. Thats a healthy one.. Nice presentation.. Makes me drool..
looks so yummy, uma. very healthy too. love the presentation. I usually make this if I have only sprouts and the basic vegetables left. I quite like it. don't add the peas, though. Nice healthy subzi uma. Nice presentation. Looks tempting. Love anything wud green moong... Looks so gud with rotis around !! like your bowl :) I make a similar version of kurma with moong dal sprouts.. next time, I will add peas too.. looks very good..
Yum, looks so so good!!! And that's such a cute picture of ur kiddos! it can't get healthier and tastier than this Uma. lovely recipe indeed. presentation bavundi and mi onion chutney chustunte kallu madutunayante nammandi. 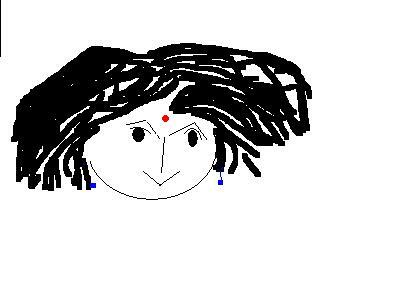 Rocking girl, do pick ur award from my blog!!! the gravy looks yum...but your rotis look amazing! Beautiful photos Uma and such a great healthy dish. Great pic of a beautiful and surely tasty recipe. Soemthing is waiting for you.